Arwell is a 9gag like, viral media, gag and vine sharing application. It contains an extremely powerful and functional admin panel, where you can manage gags, categories, pages, widgets, users, comments and whole application. Arwell is greatly documented and built on Laravel 4, Bootstrap 3, jQuery and SASS. It has facebook, twitter, pinterest and google plus share widgets, supports oAuth login, heavily ajax based, has realtime notifications system, and much more! 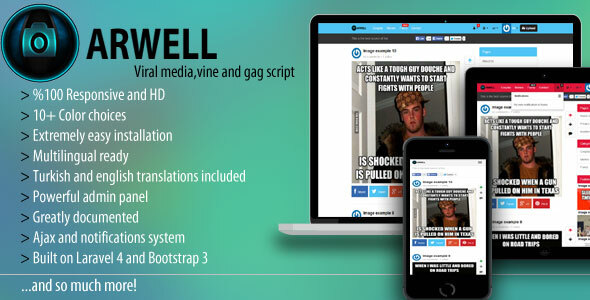 0 Response to "Arwell v1.6.1 – Viral media, vine and gag script - Codecanyon"